We usually suggest users on any social platform, then and there. But, this one was asked by at least a few people, who wanted me to tell my choice between these two smartphones – the Motorola Moto X and HTC Desire 816. These two are different in several ways, thus comparing them isn’t that easy and there are a few things you need to consider before choosing one. Note: This is a comparison between the Moto X and HTC Desire 816, the Indian variants. 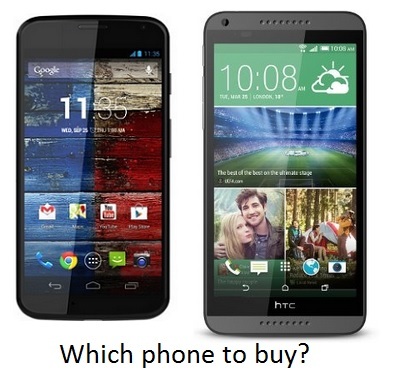 These are both priced almost the same, with the Desire 816 being a little higher in price. Screen size: This is more of a personal choice over quality, because the screen size differs – a 4.7-inch HD display in the Moto X vs 5.5-inch HD display in the Desire 816. If you are taking the display into consideration, the AMOLED one in the Moto X is better than the LCD 2 in the HTC Desire 816. Internal Specs: These both hold almost the same strength, for the reason that the Desire 816 comes with a Quad-core processor while it’s a 1.7GHz dual-core one in Moto X, but the RAM in Moto X is higher (2GB compared to 1.5GB), and it is always a known fact that it has to be a perfect combination of both if the phone has to run fast. The Moto X has a later version of GPU, i.e. Adreno 320 when compared to the Adreno 305 in HTC Desire 816. The HTC phone comes with the capability of using a MicroSD card for extra storage, while the Moto X comes with a fixed storage and no such option. Camera: The Desire 816 beats Moto X with the 13MP shooter with some extra features when compared to the 10MP one in Moto X. Both the devices can record 1080p videos at 30 fps, but the actual captures of the Moto X are not great, and you can easily differentiate between the captures made by these two devices. The front-facing camera too is better in the HTC device, with a 5-megapixel camera compared to a 2-megapixel camera in Moto X. Both the devices run the latest Android 4.4.2 KitKat but the HTC Desire 816 has the Sense UI which is quite interesting, but for those who prefer a simpler interface, the Moto X has the stock Android ROM with the most basic and easy-to-use interface, and it has the special features such as Moto Alert, Google Now, etc. So, you can make your choice based on which features you wanted in your smartphone, and which device have got those. Of course in the end, you might have to compromise with a feature or two, but that shouldn’t force you to change your opinion. Do also note that HTC has got more service centers for now, in India when compared to Motorola, if you are someone who thinks a lot about the after-sales service. If I were to suggest any alternatives to these, you can check for the Gionee Elife S5.5, Nexus 5 (which is a bit higher in price but an excellent device) and Gionee Elife E7 (which has an excellent display, great processor and camera but battery and OS aren’t the best).